The sea reached for her feet, rolling over them with a soft touch. 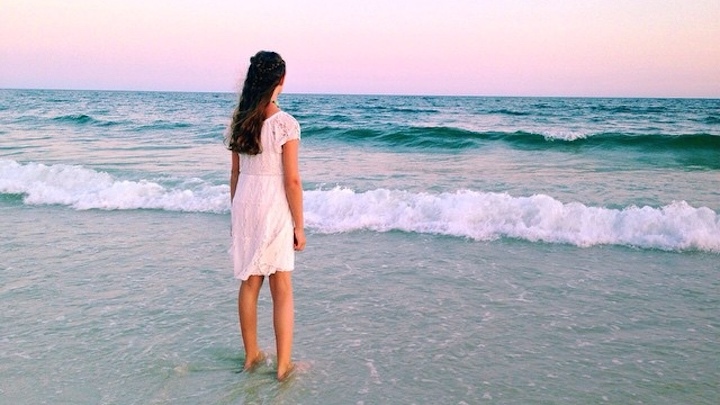 She was old enough now to know the trickery of the waves—that the gentle foam they spread over the surface was only a veil to keep hidden the secrets below. She was also old enough to know that her parents didn’t want her on the shore alone. But the sea had called for her in her dreams every night for a week, and she could no longer ignore it. There must be a reason. The water never failed to move in and out. In and out. She watched its edge, wondering what it would say if it could speak. In and out. As she agreed to let one more wave kiss her feet before heading back home, the water moved in, but its retreat revealed a golden pendant attached to a thin chain. She bent down and grabbed it before the next wave could steal it away. The shape of a trident was engraved on one side of the pendant, but a footprint was engraved on the other. A shirtless man in tattered pants stood ankle deep in the sea in front of her. She stumbled a few steps away and hid the pendant behind her back. Epharian laughed at her questions, which only made her fear turn to anger. “I’m sorry. I’m sorry, Rila,” he said through fading chuckles. The angry voice of her father came soaring over the trees by the shore. He was close. Nothing could explain it, but she trusted him. She felt connected to him and strangely, to this pendant. She threw it around her neck and collapsed. Her two slender legs had transformed into one sparkling, scaly tail with a fin at its end. Visit the Books page to get Storygrams 1-100 in a square book and read them anytime you want! Sign up for my newsletter to never miss a story or film and receive exclusive subscriber content!